Lunch with parents this Saturday noon ease the tension that has gone on over the past 2 weeks. They tell me they ran into Roger Collantes, who happens to be their friend and my favorite keynote speaker in last HR Philippines convention. In a 20 minute conversation they were able to engage in a hearty and soulful exchange. They tell me he likes my writing and if I need to ask for help on how to write a book, I can go to him. How is it that all these things happen almost consecutively in the past 3 days? 2:43pm. I pick this post up now sitting in my Mom's hospital room as she gets prepared for her 4th chemotherapy cycle. 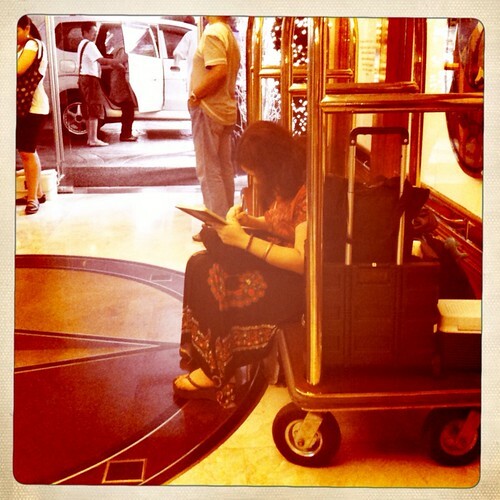 I was pretty happy because while waiting to get checked in I was able to write a few things in my Moleskine while sitting on luggage trolley. It's my first attempt to try writing in a public place after a long time. It surprised me that I barely struggled and realized that as long as I do not keep thinking about what "other people will think" about me or what I write, the words flow. My sister takes this photo. Shows it to me and says "Please take mine too." Grabbed it from her page so I can ponder about being more consistent with my writing. My pen scratches on a luggage trolley below shows my very amateur attempt at bringing writing a little bit more present in my life. This took 30 minutes to unearth. But if I keep doing it I should improve in patience's time.